It was the German-born architect Ludwig Mies van der Rohe who famously gave us the term less is more; and his use of materials that enabled new “skin and bones” structures redefined building in the early 20th century. 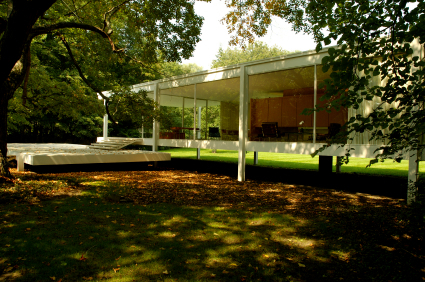 Among van der Rohe’s most famous works is the Farnsworth House, a glass house built in 1951 near Plano, Illinois; and I find it curious that variations on the expression those who live in glass houses should not throw stones predates by at least a couple of centuries a time when anyone might think to live in such a structure, let alone possess the technology to build one. With the explosion of social media, the Internet is literally and metaphorically a glass house in which so many of us have volunteered to live; yet oddly, something about the Web seems to inspire a great deal of stone throwing. I don’t know if it’s the anonymity, the fact that connection via computer allows dehumanization, or if the act of typing just turns us all into sanctimonious harpies, but there are some pretty nasty comment threads out there. It’s fairly well understood that people are often ruder to one another online than they likely would be in a real-life encounter, and this is exactly the kind of social phenomenon The Illusion of More intends to investigate. So, with regard to this site, we invite your criticism, your wit, your ideas, and even your well-written scorn if need be; but comments will be moderated and approved based on relevance, relative clarity in the writing, and basic courtesy. Our hope is to foster dialogue not diatribe, so let’s try to leave most stones un-thrown.